1. 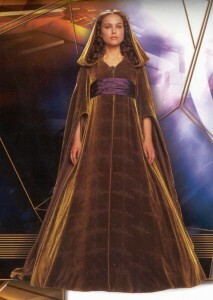 Floor-length gown with a fitted empire waist, small V-neckline, very full hood, ¾-length long bell sleeves and small train of an olive green velvet or velvet-like fabric with vertical lines of large lavender Naboo symbols at intervals throughout the gown. No panne velvet. The sleeves are lined in an iridescent lavender/green silk or silk-like fabric in a medium diamond pattern (lavender/green cross-dye preferred). The neck and sleeve edges are trimmed in narrow cord in an olive green silk or silk-like fabric. The hood is self-lined in the velvet. Costumer should appear pregnant. 2. Very wide empire-waist crinkled sash in a purple iridescent silk or silk-like taffeta. 3. Medium-sized circular brooch of purple and olive iridescent beads rimmed with a narrow twisted burnished bronze cord trim and a short fringe of purple and olive iridescent beads. 4. Low heeled coordinating tailored pumps or flats. 5. Hair is long and parted, curled in loose spirals falling softly around face and over shoulders (with hood down) or peeking out of from the drapes of the hood (when worn hood up). Naturally occurring hair colors only, no bangs.